It is difficult to believe that summers nearly over. I hope you've done better than I with your "things to try" list. Inspired by Joyce's blog post, I've been working away at my ATC's. The fronts are almost completed. I'll save the hand-finishing for a car trip, and the rest will wait for a winter's day at the sewing machine. I attended a fibre fest with a friend, and the felting I saw there inspired me to come home and play. I experimented with Nuno felting and wet felting, and was quite impressed by my finished pieces. (Wet felting is a good way to get clean hands after too much gardening). Reading about needlework is a favourite occupation of mine, and I really enjoyed the article Festival of Broken Needles in #71 of Inspirations. Visit www.cargocollective.com/audsomee and then www.stitchinfingers.com which has a virtual tribute to needles. Stitchinfingers is a fabulous site; I loved the variety of work displayed there. Those who like to read, check out www.driverworks.ca for the book Letters to Jennifer from Maudie and Oliver, by EAC member Sharon Grey from Winnipeg. It's about cats, cancer, and humour, and includes more than the occasional reference to Sharon's passion for blackwork. Well done, Sharon. 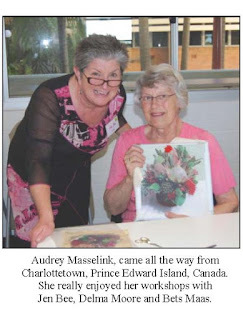 While thinking about Australia, look at this photo of Audrey Masselink that appeared in the Koala Conventions newsletter. 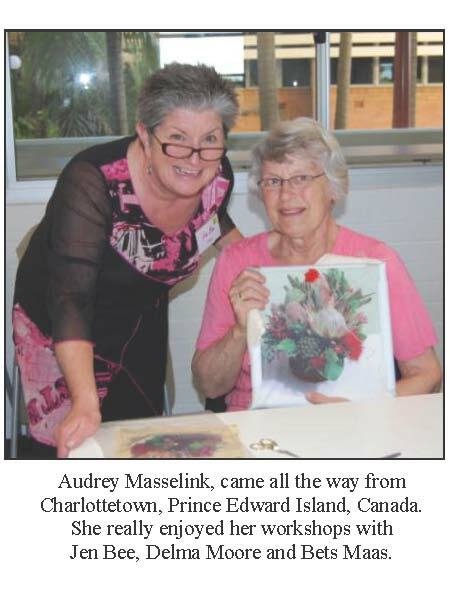 Way to go, Audrey. Looks like you had a great time. Finally, for a real heart-breaker of a site, sent to me by Marg Whittleton (Quinte Guild). The reason for keeping the bits and pieces of fabric that foundling babies were wearing (or wrapped in) was to identify the child if the parents returned to claim him or her. Watch the slide show at www.threadsoffeeling.com Click on "The Online Exhibition" towards the bottom left of the screen.